Who What Wear readers may have noticed a theme in our footwear coverage as of late: the "ugly" shoe trend is dominating fashion right now—and we aren't complaining. For starters, there are the Gigi Hadid–approved Adidas pool slides and Ashley Olsen's Birkenstocks. And who could forget Christopher Kane's bejeweled Crocs that debuted on the runway at New York Fashion Week? 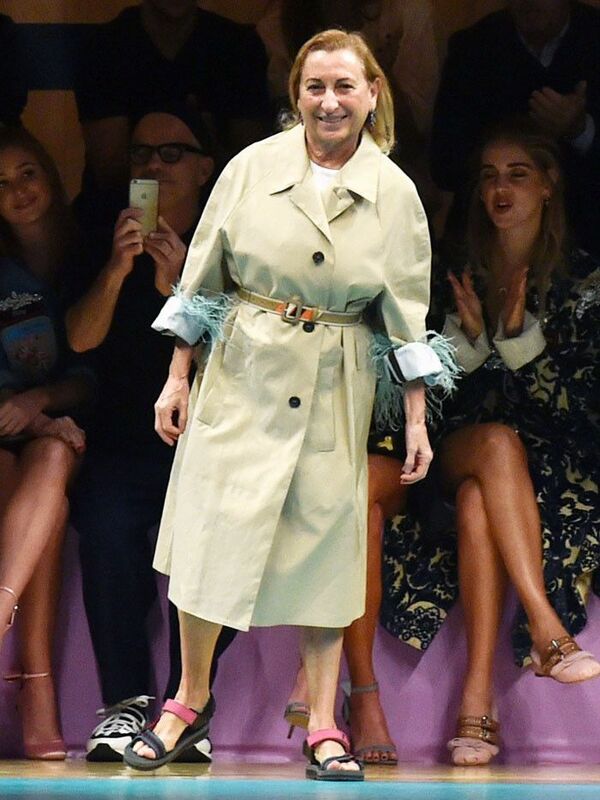 Now, we have another influential name to add to the list of supporters: none other than Miuccia Prada. Taking her bow at the end of the Miu Miu show during Paris Fashion Week, the designer stepped out in a pair of multicolored Teva sandals. She gave the casual shoes a sophisticated touch with a classic khaki trench coat cinched at the waist. All in all, Prada is proof that this comfortable trend is definitely here to stay. Scroll down to see Miuccia Prada's full outfit, and go a bit further to see our favorite looks from the Miu Miu S/S 17 show! What are your thoughts on the "ugly" shoe trend? Tell us in the comments below, and then shop Tevas online for yourself!